Technology has definitely made the world a smaller place, reducing barriers for gaining customers across the globe. With the advent of online marketing, it is interesting to see how businesses use technology in creative and innovative ways to communicate with customers. While online channels like social media and emails are effective means to communicate, there is absolutely no replacement for the experience exhibitions and tradeshows can provide: Personal, face-to-face interaction. Exhibitions and events will always remain one of the main tactics used by marketing teams to get in front of customers and decision-makers, especially when you are entering a new market. In fact, a recent research from the Centre for Exhibition Industry Research (CEIR)* states that the global exhibition industry is going to see a new peak in 2018. While marketers understand the importance and benefits of trade shows and exhibitions, a staggering 59%** claim they do not know how to measure event ROI, and continue to exhibit because they’ve either participated previously in the event or because their competitors participate. This lack of know-how to maximize and report ROI does not work in favour of marketers in securing budgets for future events. Below are key pointers to adhere to turn events and tradeshows into a positive ROI machine. Set your goals. The first step in getting goals right is to get a broader-level understanding of the corporate and marketing strategy. This could be creating brand awareness, lead generation, customer engagement, education or even generating sales. For instance, according to Event Marketing Institute’s Event Track report, 81% of businesses stated ‘increasing brand awareness’ was the primary goal in event marketing; and 79% voted for ‘increasing sales’. Invest in booth design. First impressions matter. Customers can form first impressions of brands based on the appearance of booth design in only one tenth of a second. An impressive and custom exhibition stand design will definitely increase costs, but at the same time will boost returns as well. Successful brands work meticulously on getting their stand designs right because they understand that exhibition booth designs can make or break a brand’s success at a trade show. Leverage technology. In extremely competitive spaces like trade shows, technology can help brands differentiate and stand out in the crowd. Technology like Virtual Reality (VR) enables booth visitors to be fully immersed in realistic three-dimensional interactive environments. The technology was a little far from reality a few years ago and today, VR has come leaps and bounds. It is more affordable and accessible and we see a widespread use of VR at events and exhibitions. For example, given the space constraint at an exhibition booth, VR can be used to walk audience through a virtual showroom and create unlimited floor space to showcase products or services. Or consider an example where a real estate company wants its audience to experience its new property. There are clearly no limits to how creative one can get with this technology. However, connecting the VR setting to brand stories is something a lot of brands don't do well. Getting this connection right is one of the most important factors to creating experiences visitors will never forget. Digital Signage and touch screens can provide interactive experience to visitors, driving engagement at trade shows. Imagine, instead of pushing a brochure with a ton of content at visitors, brands can provide a platform with touch screens for visitors to interactively learn about them based on visitor’s curiosity. Technologies like beacons and RFID also make it easier to collect critical data for measuring trade show ROI. Communicate event participation. Notify existing and potential customers about the company’s participation at an event. Press releases, email communications and social media can be leveraged for amplifying a brand’s reach before, during and after the event. Post show action. A specific plan should be in place to follow up on all potential prospects met at the trade show. A tailored on-going email nurture campaign can work wonders to push leads further down the sales cycle. It is not just about driving traffic to exhibition booths, a successful exhibition participation is about generating quality leads and moving them down the sales/services pipeline. 72% of marketers in the EMEA region prioritize inbound as their primary approach to marketing. And interestingly, 71%* of businesses in the region state that growing traffic to their websites and converting leads to customers are their top marketing priorities for the next twelve months. Which means, if you aren't currently employing inbound for your business, three of your competitors more likely are. Do we have your attention? Inbound marketing campaigns achieve higher ROI than outbound techniques regardless of your company size, geography or budget. Inbound marketing is focused on attracting customers through relevant content and adding value at every stage of your buyer's journey. As opposed to outbound marketing, inbound marketing does not fight for your potential customers' attention. With inbound marketing, potential customers find you through channels like search engines, blogs, and social media. By creating content designed to address the problems and needs of your ideal customers, you attract qualified prospects and build trust and credibility for your business. Below are some key stats that support the premise of implementing an inbound marketing strategy for your business. Leverage them to get your CEO’s attention! 7. Companies who have prioritized business blogging are 13 times more likely to enjoy positive Inbound Marketing ROI. The 'Brand-Agency' relationships are no longer as simple as they used to be. Brands working with agencies that deliver creative work see the agency as a natural extension of their marketing teams. Brands need their agencies to work collaboratively, and provide not just creative, but also concepts that add value to their brand, business goals and investment. A survey conducted by Marketing Week shows that 52% of marketers are fairly happy with the service they receive from agency partners but only 8%, which is fewer than one in 10, state that they are ‘very satisfied’*. So, how can an agency become a partner of choice that offers value to brands? It is not just about tactics, strategy is key. Let’s draw some parallels from the ‘Output vs. Outcome’ debate, where tactics are your output and strategy is your outcome. Tactics, like output, are activities you execute to reach out to your customers. For example, content marketing tactics like blogging, social media updates, videos: The ‘What’. These tactics are extremely valuable and form the basic blocks of your overall strategy. But the trouble arises when you measure the effectiveness of your marketing efforts strictly based only on these outputs or tactics. Strategy on the other hand, like outcome, is a focused goal that relates to business objectives. So basically, ‘outcomes’ are the results of hard work expended through your outputs: The ‘Why’. Being able to track the effect of your tactics on your strategy plays a very important role in earning a brand’s trust. Speed and collaboration have never been more important. Pace of delivery and the capability to be agile has become a basic necessity to respond quickly to both the market and consumers. Brands look for leaner agencies that are able to turnaround projects that have seemingly difficult deadlines, including some that come around in the last minute, very quickly. And let’s not forget that great collaborations create great work. To deliver successful projects, involving brands at every stage of the project from start to finish becomes very crucial. Move measurement upfront. Brands today need agencies to present result-driven ideas along with the creatives. They want to be able to measure the impact of any creative proposed and look for agencies to mention the intent to capture this marketing performance data upfront. Also, a surprising number of marketing leaders still struggle to justify the marketing investments made, and want the agencies to pitch in more. Agencies can thrive in this rapidly changing market only if they clearly understand and articulate the value they can offer to brands. And with that, here's to a highly measurable, highly creative and highly committed ‘Brand-Agency’ relationship! Its IMI’s 10th Anniversary! This is how we are celebrating..
November 7th 2017 marks our 10-year anniversary as a company. We began our journey as an events and exhibition stand provider, specializing in high-end design and construction solutions. Whilst events and exhibitions have been our forte since inception, over the ensuing decade the company has flourished through its ability to forge lasting partnerships with its diverse, and prestigious client base. Today, IMI serves over 130 major brands globally with its end-to-end creative marketing expertise. 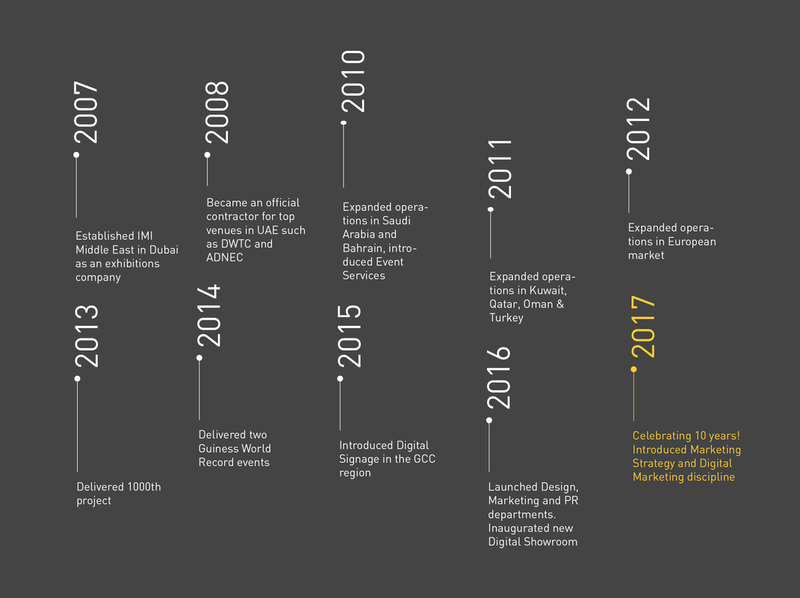 To toast a decade of dedication to providing premium marketing solutions worldwide, we are reasserting ourselves as a one-stop, full-service creative marketing agency offering end-to-end solutions spanning all online and offline marketing requirements. Bringing fresh identity to the brand, along with new services and a renewed energy, IMI now offers integrated marketing and communication solutions that include design, marketing strategy, digital marketing, content and social media marketing, web and mobile application development, photography and video services, as well as event, digital signage and promotional products. To celebrate the milestone, we launched a new website which showcases the new services and reflects our ten years of innovation and continuous evolution. It's Q4! As businesses proceed to run the last leg of relay 2017, and consider planning their marketing priorities for 2018, it is important to take a close look at what’s really happening in the marketplace. In this post we highlight key trends that we believe will help you invest in the right digital marketing tactics that are going to position your firm to win the race. While we are all geared up to embrace the perfect outdoor weather season here in Dubai, consider you are looking to buy a pair of sneakers for running an upcoming race. You are going about your routine and a display ad shows up with a message that reads “The best sneakers in town with flexible copolymer and cross linked foam. Buy now”. And a competitor’s message that reads “When the shoes get lighter, the moves get faster. Shop now”. Which ad would you click on? You get the point. Creating customer centric content has been on the front burner this year and we believe it is going to be as important as we head into 2018. Marketers need to take a hard look at the content they are putting out and ask if it is customer-centric? To be able to create content that talks your customer's language, marketers need to create buyer personas, that highlight buyer's roles, demographics, goals and challenges and even quirky bits of their personalities. This detailed representation of the buyer will allow to create targeted, vertical specific content that entices your buyer to click on your content piece. Given that YouTube is now the second largest search engine on the web, it is no surprise that video marketing is growing at an alarming rate. A recent study from Cisco states that video marketing will account for 80% of all internet traffic by 2019. Thanks to its viral nature and the ability to connect emotionally with the target audience, videos done right create stronger customer attention and promote brand awareness, which ultimately translates to more leads and sales. Video marketing can also boost your search rankings. Studies show that adding video to your websites and landing pages, improves click-through rates. In fact, according to Forrester, including video in emails lead to a whopping 200-300% increase in click-throughs; and including videos on a landing page increases conversion by 80%, thereby increasing your SEO score. If we were to decide on who should get the last-leg runner position in the 2018 digital marketing relay, we would definitely put videos on top of the list! Given all these benefits, video marketing should stand out as the top priority tactic to include in your digital marketing priorities in 2018 and beyond. We already know how effective video marketing is. Live videos are only an extension of this most popular digital marketing tactic. In 2017, we witnessed in front-row seats, every social media platform introducing live streaming as part of their growth strategy. Live videos provide a platform to share your message in a more immediate and real-time fashion. Plus, audience today look for human connection with the brands they follow and live streaming provides an opportunity to establish close customer relationships. One does not win a relay if you don’t carefully choose your sprint runners. Selecting and investing in the most return worthy digital marketing tactics in 2018 will be key to staying competitive and finishing strong. And the race of course isn’t really over as soon as you cross the finish line, you need to continuously evaluate your tactics' performance to achieve your growth milestones. Get in touch with us to see how we can help you beat and get ahead of competition.